Alchemia Art of Hair salon, located inside the beautifully restored Somerset Apartments at Sheridan and Argyle, has started a beautiful tradition and would like everyone to help them with it. On Tuesday, Edward and Joey posted, "We would like to invite everyone to join us in promoting love! We have chalk out front and encourage everyone passing by to stop and write LOVE (or other heartfelt messages). Orlando...our hearts go out to you. 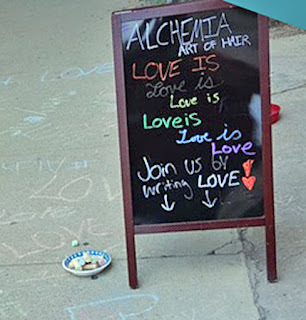 Alchemia Art of Hair loves everyone!" People joined in, and by Friday, they posted, "Wow...the last couple days have been simply magic in Uptown. Our sidewalk love promotion is getting bigger and bigger! Every day we more people stopping to share messages of love and acceptance to others. We hope that we can cover the entire block by the end of the month! In related Uptown news, our amazing friends and family at Big Chicks hosted a fundraiser event last night for Orlando. After donating ALL the sales rung, Big Chicks collected $31,000!!! Let's keep the love flowing Chicago! THIS is what a community is and does!" 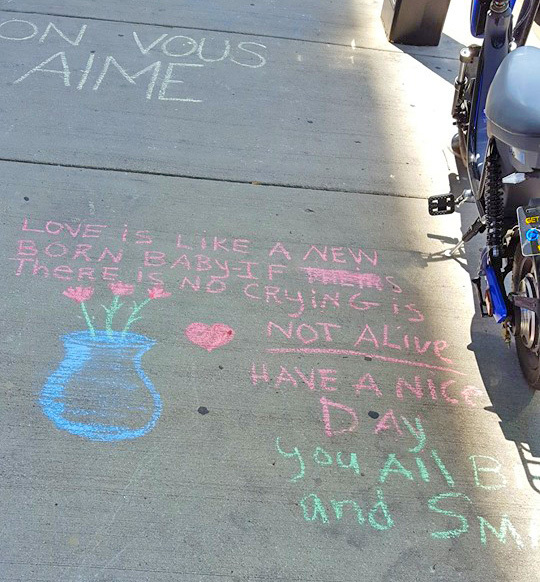 If you find yourself near 5009 N Sheridan, grab some chalk and spread some love.